“Eat breakfast like a king, lunch like a prince and dinner like a pauper”, by Adelle Davis is an excellent way of suggesting how valuable eating breakfast is. Eating right food at right time helps in speeding up metabolism and by satisfying the food cravings through out the day. Hana Kahleova, a researcher at the Institute for Clinical and Experimental Medicine insisted “Eating breakfast and lunch is more beneficial than skipping breakfast and eating lunch and dinner, because the fat deposition is bigger in the afternoon and after the evening meal. In the book called The Big Breakfast Diet, by Daniela Jakubowicz, MD., Jakubowicz says that eating a 610- to 850-calorie breakfast before 9 a.m. fires up our metabolism by taking advantage of our body's circadian rhythms. These rhythms influence hormones, how our body uses carbohydrates and proteins for fuel, and how efficiently it burns body fat. 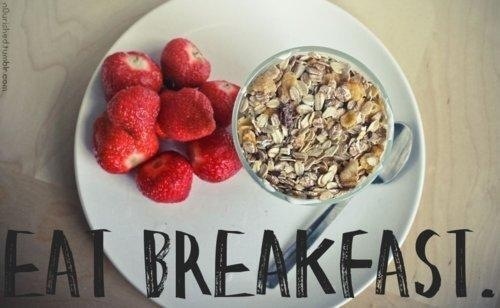 Breakfast must contain dietary fiber, protein, carbohydrates and small amount of healthy fat. There are so many healthy and creative ways to make and have breakfast. Our way is easiest and absolutely time saving… Smoothies.We enjoy our smoothies every morning. Choose unflavored yogurt and add sugar and fruits yourself to avoid added sugar and preservatives/chemicals. Add ground cinnamon to tea, cereal, oatmeal to enhance the taste as well as added nutritional advantage. Add chia seeds, hemp seeds, flax seed powder wherever possible for extra boost of healthy fats. Add fruits especially like berries (strawberries, blueberries, raspberries) to emphasize a great healthy start of the day. Add a dairy in any form low fat milk, yogurt, cheese. Try non-dairy milk options like soymilk, almond milk, rice milk.